COLOURS: If you require a bespoke RAL colour you must state this in the comments field when ordering & we will contact you for details. An extra 10% on the net price will be charged and delivery times slightly increased. There are some instances when traditional moving and display equipment can both be inefficient. While some wheeled cargo carts can hold a wide variety of items, they are not suitable for putting certain items on display. Shelved units can show off important items to others but cannot move them effectively. The Workplace Depot offers a product which accomplishes both features with ease. The 2 Handle Table Top Trolley is a heavy duty trolley which can show off items and function as a shelf while also allowing for multiple items to be transported from place to place. What is The Purpose of The 2 Handle Table Top Trolley? This trolley is designed to provide two important functions. The unit provides a spacious area to put items on display for others while also providing a way to move multiple pieces of cargo easily. This multi-purpose tool can be great to have on hand in garages, classrooms, storage rooms, and plenty of other locations. It can be used by homeowners and business owners to help improve the options they have when it comes to displaying and transporting items. This pull along trolley can prove very valuable in multiple locations. In academic institutions, job fairs, or meetings, the 2 handle table to trolley can be used to store important documents, learning aids, projectors, and more. The trolley is also useful in stockrooms, garages, and factories. Multiple tools and important components can be stored and transported to the appropriate location when needed. Homeowners and business owners can both make use of this versatile trolley cart. 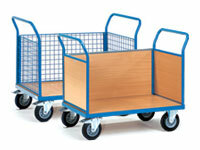 Tradesmen can also benefit from having a mobile and spacious trolley on hand. Teachers and those who are in the marketing field can also be used to transport important information to meetings and class and display it properly. This particular heavy duty platform trolley can even be used as a furniture piece in certain areas like workshops and retailers. 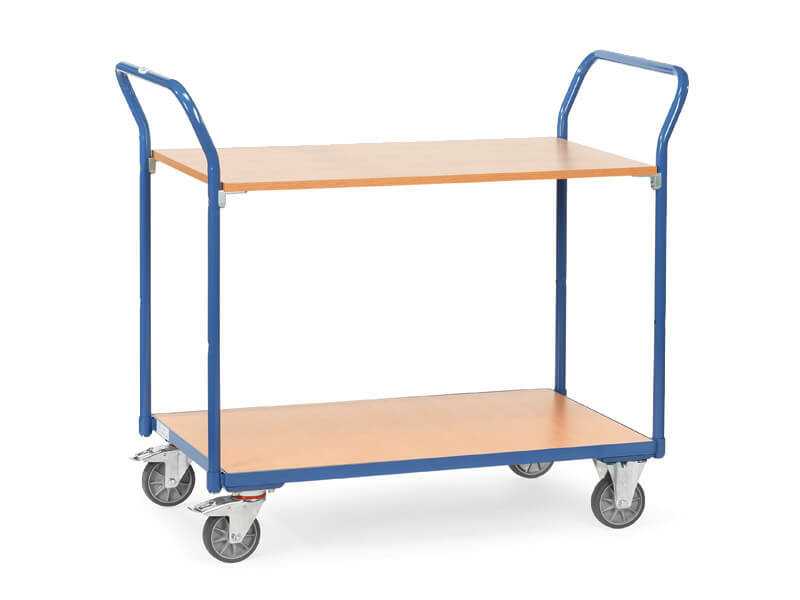 The 2 handle table top trolley has a 200kg capacity and tubular welded steel design. 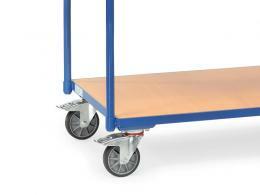 With two fixed and two swivel wheels, the cart can easily transport products on the beech faced particle board deck. Multiple colors are available, and the product comes with a ten year warranty. The trolley can be delivered within ten to fifteen working days and is guaranteed to improve any residential storage shed, commercial storage room, and nearly any other location.